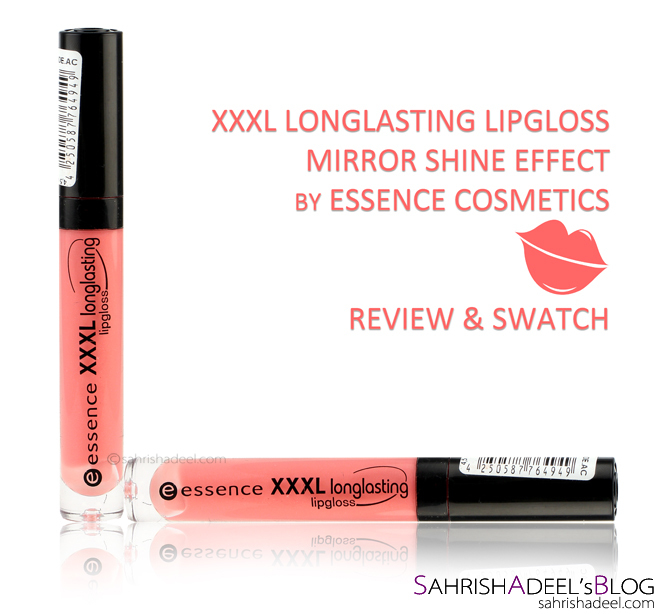 XXXL Long Lasting Lip Gloss Mirror Shine Effect by Essence Cosmetics - Review & Swatch | Sahrish Adeel - Malaysia based Pakistani Beauty & Lifestyle Blogger! I know there are people who do not like lip glosses but if you want to fall in love, XXXL Long Lasting Lip Gloss Mirror Shine Effect by Essence Cosmetics might be worth a try. Want to know why? One liner review? Well, a moisturizing lip gloss that does not feel sticky and have a mild & yummy scent! For me, these three things are enough to choose a lip gloss. This lip gloss is indeed long lasting in term of keeping the lips moisturized for 3+ hours for a person who tends to eat lip products (only when applied on lips). The shine is just perfect when the product is first applied with easy to use brush applicator. The formula is a bit thick and when I first used it, I was so worried that it is going to give that awful looking sticky-ness but I became a fan of this gloss when it didn't do any such thing. I also love to wear it over my matte lippies when I need a bit of shine since the coverage is quite sheer for this shade on its own. Overall, loving this gloss since I first used it. There is nothing to complain about. Essence is also available worldwide in drugstore and cosmetics stores. For more information, stay tuned on Essence Pakistan's Facebook Page. - Reviews on Essence's products. - Reviews on Lip Glosses.